Exactly one year ago, we complained that some manufacturers were shipping laptops with "fake" RGBW 4K UHD displays without advertising them as such. It appears that the trend has stopped now that RGBW panels are nowhere to be found on the latest 4K laptops. When Apple released its first MacBook Pro Retina laptop in 2012, other OEMs were quick to jump onboard. Windows laptops with native display resolutions greater than 1080p became available to offer potentially crisper image quality and deeper colors. Some, however, took a more untruthful route to 4K reproduction as explained in our original article here. Since then, we've been on the lookout for more 4K laptops equipped with RGBW panels instead of RGB. We're pleasantly surprised to find that none of the 34 4K laptops we reviewed over the past year had RGBW panels. While we can't speak for every single 4K release thus far, it's safe to say that most major OEMs have now abandoned the RGBW approach in favor of traditional RGB. LG Philips and Samsung in particular have likely dropped production on RGBW laptop panels as these two manufacturers were the biggest providers of such displays. RGBW vs. RGB is an important concept to grasp for those who are seeking a "true" 4K experience. 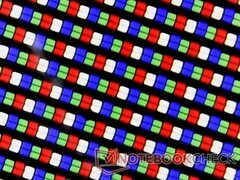 The addition of a white pixel in the subpixel matrix replaces existing red, green, and blue pixels that would have otherwise been present on a regular RGB panel. This impacts color quality, contrast, and crispness of the overall picture. This practice may still exist on certain HDTVs and smartphones.